FREE 3-MONTH TRIAL LISTING for your VACATION RENTAL! This vacation, select a home, townhouse, condo or villa from Vero Beach vacation rentals. The accomodations are economical and offer great comfort as your "home away from home." Pamper yourself this year and forget the motels, hotels and cramped quarters. Whether you've come to Vero Beach to winter and visit old friends and relatives or looking for a central spot from which to tour Florida, you'll find perfect accomodations at Vero Beach vacation rentals. 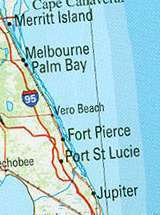 Vero Beach is about 70 miles south of Titusville and the nation's Space Center. From here space launches can be seen during the day or night and probably from your Vero Beach vacation rentals. For the tourist there are museums, preserves and eco parks along the coast as well as an abundance of water activities because of the Vero Beach location on the Atlantic Ocean. A trip into the Orlando area (about 100 miles) and the major theme parks of that area is only about a 90-minute drive.